You can never have too much of storage. If you are looking for somewhere to store various belongings or items, deck boxes can be the perfect solution. This is because it provides you with the necessary structure and can act as an attractive piece of furniture as well. Deck boxes have been around for quite a while but are such an important aspect of the home that they continue to be a popular fixture. One thing that you cannot deny about this Lifetime deck box is its size. It is quite large, capable of holding up to around 130 gallons or 16.4 cubic feet. This means that you will be able to store numerous objects, all of varying sizes in it. Therefore, it gives you more options regarding how you can use this Lifetime deck box. The box is topped off with a lid with a spring hinge so that it can be closed more gently and will not slam shut. Additionally, the lid can be locked, ensuring that all of your possessions remain secure. This box has been made to withstand the elements. It is composed of high density poly-ethylene and steel hinges that are weather resistant. It also offers UV-protection. When combined with the fact that it acts as a sealant against water, you know that this box will last a while. In fact, the company actually offers a ten year warranty on their deck box. You can also be reassured that none of the items inside are going to be exposed to water. 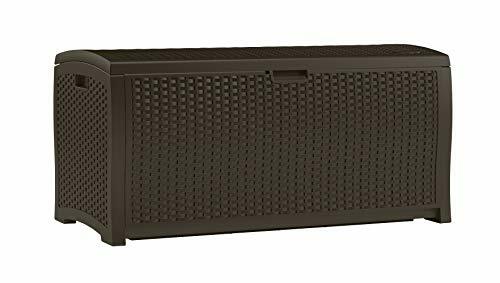 This deck box is available in shades of brown, black, and tan. Do you want a deck box that looks a little more natural and is going to blend perfectly with your garden or exterior surroundings? If these are your requirements, then the Suncast deck box will be just what you are looking for. It has a beautiful wicker design that is brown in color, perfect for an area with lots of greenery. This will work perfectly with whatever other pieces of furniture that you have. As a bonus, it is constructed of resin which makes it last for a much longer time. Suncast backs this claim up with a warranty for five years. Now, this deck box is quite big, capable of holding around 90 gallons. Although it has been built with storing patio furniture in mind, it really is durable to hold anything that you want. There are two handles on either side of the deck box which allows you to carry it around with ease. You will also not have to fuss with putting this deck box together once it arrives at your doorstep. You will not require any tools at all to get this deck box together. Deck storage box: beautiful wicker outdoor box has a 99-gallon capacity for patio, deck, yard, porch, garage, and shed storage! Versatile: store pool toys, grill supplies, tools, gardening items, sports equipment, patio furniture, and more! 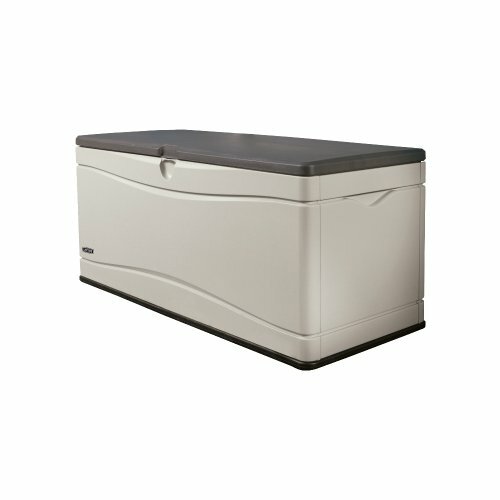 If you require something a little larger, then you are going to want to get this Suncast deck box. 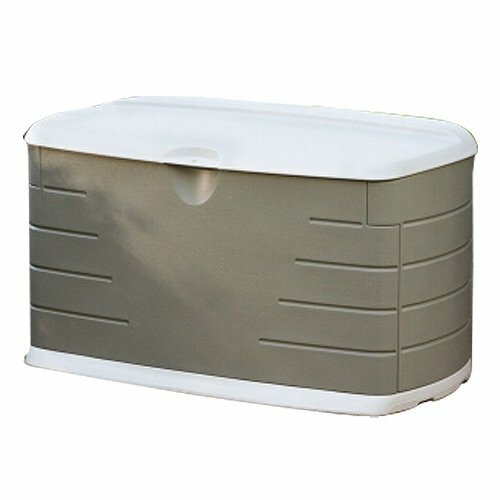 This box has a larger interior, with a capacity of around 127 gallons. The deck box also looks quite classic, which means that wherever that you put it, it certainly will not be an eyesore. It is available in a gorgeous taupe color. The deck box is made out of resin, which is to say that it is built to last. This especially comes in handy if you are looking to keep the deck box outside for most of the time. What is really great about this Suncast deck box is that you can do more than just store things on the inside. There are small compartments on the lid where smaller items can easily be stored. The lid also acts as a great place to store things on the top, if you choose. While the construction of the deck box may look quite complicated, nothing could be simpler. Without any tools at all, you will be able to put the box together. 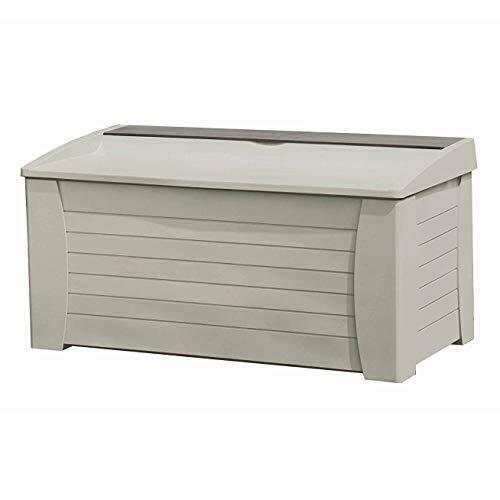 PATIO STORAGE BOX: Beautiful plastic outdoor box has a 127-gallon capacity for patio, deck, yard, porch, garage, and shed storage! If you are looking for the ultimate in garden storage then look no further than the Rubbermaid deck box. One of the first things that you should be made aware about this deck box is that it is incredibly durable. It has a double walled construction to make sure that it can take more weight and pressure. It has also been made leak-proof and weather resistant. This means that you can store this deck box outside all year round and not have to worry about it falling apart. Due to its solid construction, it is also incredibly difficult to damage or dent this box. If you are storing anything with any value, the lid of this deck box can be locked, allowing for greater security. Within the Rubber deck box, you will be able to store the items for about 120 gallons or 16 cubic feet. This space also has more than one function. Once the lid is closed, the deck box can seat up to three adults comfortably. It can also easily double as a table if you required one. Why have a deck box that functions only as a deck box when you can get one that is so much more. This is precisely what the Keter Eden deck box is – something more. 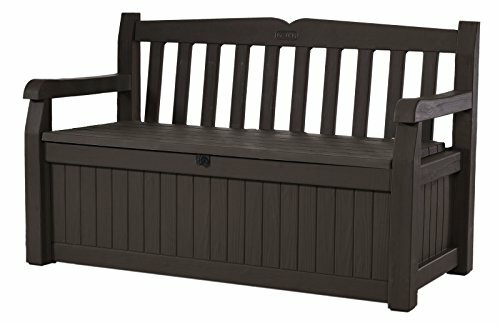 At first glance, it appears to be an outdoor bench and it actually is one. It is able to hold up individuals who weigh, in combination, over 700 pounds. Below this beautiful seat, however, lies the deck box with a capacity of 70 gallons. Not only is it plenty roomy for all of your stuff, it is also weatherproof. It has been designed so there no moisture can enter in, keeping all of your belongings dry even during rainy weather. There is also an in-built ventilation to make sure that they remain in good condition. There is also a discrete lock on the deck box so that you can make sure that none of the items are removed from the box. Conclusion: When choosing the right deck box for your home, there are numerous different factors to consider. Now, there is a lot less that you have to consider. All of these deck boxes have been specifically crafted to be attractive, durable, and have an abundance of storage space. Each of these will prove to be more than adequate for you.